As an antidote to the pheasant. Here is another of my one a day photos. The green looks too blue maybe my PC? did try on two monitors. I had to zoom out to see the full image and some how it grows on one. Did try warming it a bit but lost the coolness of the ivy which tends to be a bluish green. What calibration/profiling are you using on your monitors Eric? Native on quite a few monitors tends in my experience to be blue biased. Interesting shot David. The wood and fence posts are a little too bright for me. Was it hand held? 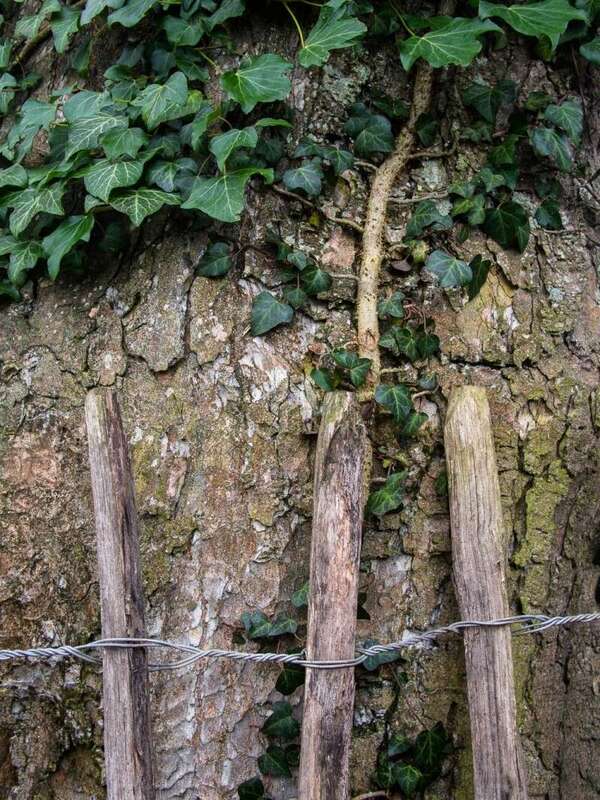 The fence posts are a bit soft but the bark looks better. Perhaps you focussed on the tree? Interesting shot, I the bottom of the fence posts are looking slightly soft to me. I love the third post from the left as the ivy and the post almost look as one. Had a look at the original file. Not enough DOF probably cold and forgot to reset the camera - my error!!! Trunk is sharp and the palings on the right are OK but go off to the left. I think I will go back and redo. Thanks for the comments. with the textures in the shot, have you tried to do some tone mapping to bring them out more? Hi Chris, I still get confused by what is meant by tone mapping? What were you thinking in this context. Was it to increase mid tone contrast? Tone mapping has to do with localised contrast, and increasing it or decreasing I think In PS it is under the HDR settings (Probably wrong as I don't have PS on this computer) - BUT it is not HDR unless you are using multiple images. 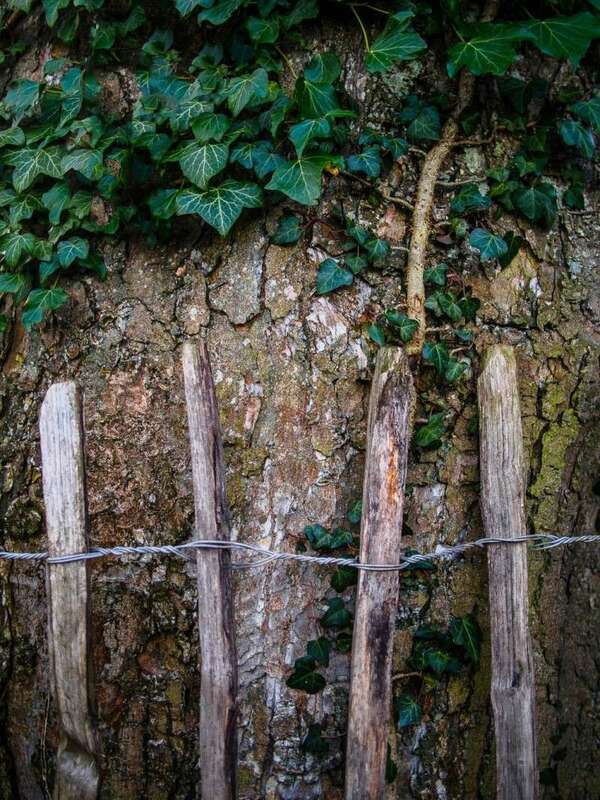 In this image I would imagine it would be quite effective as its quite light it would bring more detail out in the shadow and more detail out on the bark, and posts maybe giving a the posts a bit more definition?. I could be wrong, and talking rubbish, but that is how i visualise it. Hi Chris, that does explain my confusion as I think the term is getting used for different processes. I had taken it to refer to the way tones were plotted from the original linear capture to create the appropriate gamma curve in a processed image. As I very rarely use HDR it would not have thought of using those controls on this image. What might get the effect you are thinking about might be to apply more of an S curve. Generally but not always I tend to go for a less processed quieter look to my pictures than is currently fashionable. As Mike says about me you cannot predict what I will do next. As an experiment I will go back and rethink the RAW processing of this one to increase the contrast and see how that works. Probably will repost but still with the original focus flaws some time next week. As far as I am aware and I stand to be corrected I am only a beginner. I do see the point about tone mapping and HDR being separate things even though when using HDR local tone mapping is used as well. However local tone mapping and tone mapping are two different things. Photomatrix has local tone mapping and as Chris says it is a localised thing but tone mapping is the S curve David talks about. CS5 does have tone mapping in the HDR bit but it's not local tone mapping. Same with RawTherapee. But HDR means High Dynamic Range and you don't need multi images to be HDR. RAW at 12 bit (Pentax) or 14 bit (Nikon) clearly has a higher dynamic range than Jpeg (Except for latest which in not in use yet) and could be considered as HDR when the full range is used. Unless the image needs HDR then combining images will not produce HDR it may produce some surreal effects but that's not HDR although it could be local tone mapping. I have moved from auto HDR to manual using layers and masks in order to get the local tone mapping I have not got Photomatrix. Here is the version I promised. It has been given rather longer in the oven than normal and for me is rather over baked. The OOF bits are still there! I clear improvement. Well done. All a matter of taste. My preference is for something between in processing probably nearer the first image but slightly darker for screen viewing. There were no local adjustments made, all global done in LR it went to CC for some content aware fill to the top left. The histogram of this second image suggests to me that it would not print well as most of the tones are on the dark side. I would agree that on screen and print are very different. Your the expert on printing. I use two monitors laptops (Sony) own and second one behind and above laptop (LG) I have not got around to matching them which my Laptop does allow, so I moved between both monitors, and in both cases second image looked the best. Well here as promised is the image reshot with better DOF. It is rather different as I had another lens on the camera 20mm rather than 45mm. Also with the different viewpoint I have not needed to fill in the top left corner artificially!